The amount of things to do in Texas is limitless. We’re continuing to explore and discover new gems in Houston, and when you throw other Texas cities into the mix, the potential for adventure is absolutely exponential! Austin is one of our favorite spots for weekend adventures. Our fearless Texas capital is just a few hours away, we find ourselves exploring the town on the reg. By no means are we locals, but we sure know how to party with them. And by combining their recommendations with our experiences, we proudly present our latest and greatest Austin weekend guide! Disclaimer: This post is sponsored by Hilton Austin and the Explore Like a Local Campaign. All opinions are my own. Despite rolling into town late on Friday night, Austin welcomed us with open arms. 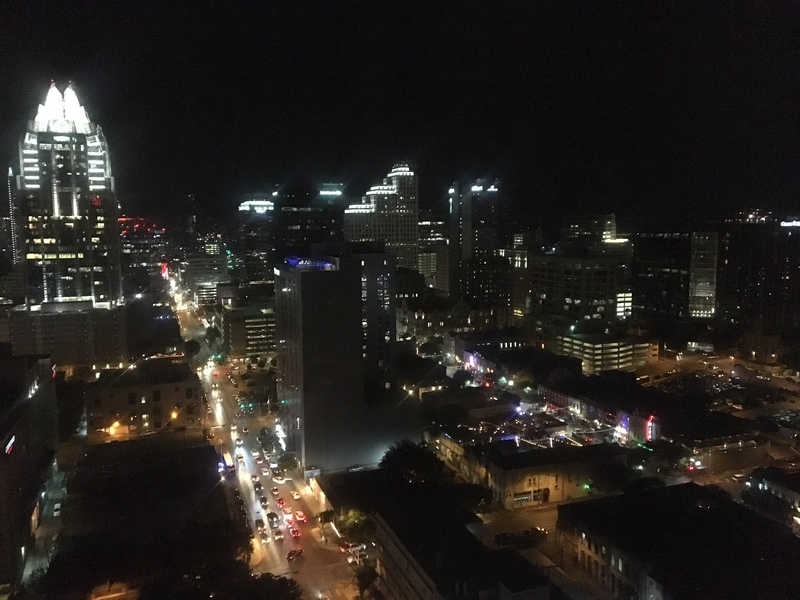 We checked into the Hilton Austin in Downtown, which is superbly located off 5th Street, just blocks away from Rainey and 6th Street. We were able to valet the car, do a quick change, and then walk to Revue for a late dinner. Located off Red River just blocks away from Rainey Street, Revue was an interesting experience that served decadent Italian, Asian, and American dishes tapas set in a movie-set like ambiance. It was like having 5 restaurant vibes in a food court, but one shared menu. After dinner we went out on Rainey Street, which has a laid back, yet mildly chaotic vibe. We grabbed cocktails and sat on the patio of Parlor Room, and then hula hopped and played corn hole at Luster Pearl. Afterwards, since it was National Donut Day (why, is that a thing? 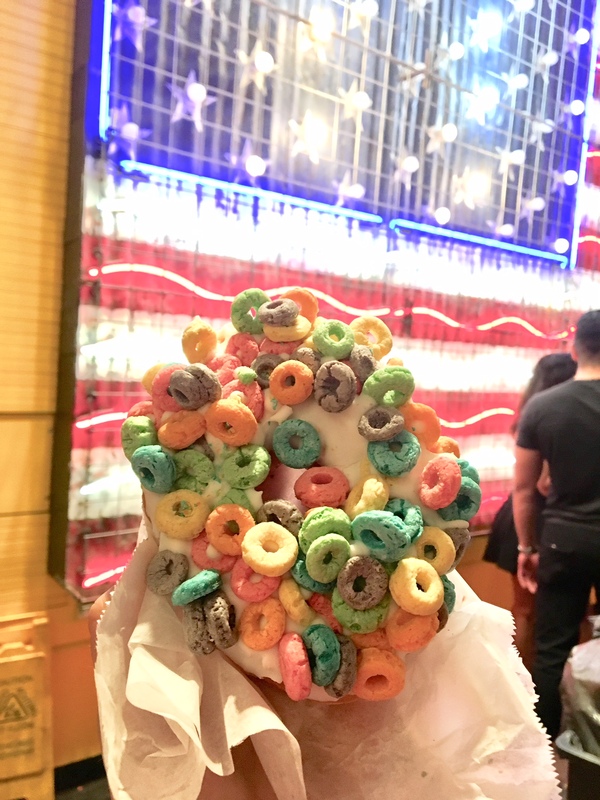 ), we wandered over to 6th Street to grab decadent sugary delights at Voodoo Doughnut. Pro tip: THEY ONLY TAKE CASH. Also, they’re open 24/7 and have vegan donuts!! Heavenly! Also three donuts cost like $5. So best post-night food everrrr. In the mood for doughnuts during the day? Def hit up Gordough’s! Then we walked back to the Hilton Austin hotel, which need I remind you, was primly located just a few blocks away!! I’m a huge fan of living that big city life and not using a car! Also situated on one of the top floors, the Austin skyline views were absolutely incredible!! All weekends should start with brunch. It’s the best meal of the week. And rolling out of bed and into the Cannon + Belle restaurant of the Hilton Austin for the breakfast buffet was not the worst way to start the morning. Since I’m doing the vegan thing, I was most impressed by the avocado toast on the menu with watermelon radishes (salivating! ), and of course, the mimosas! We split a bottle with a mix of orange and grapefruit juice. Fueled up and ready to go, we seized the day in the best way that we could! By floating the river. God bless this amazing Texas past time. Just a short drive away in San Marcos, we stocked our cooler with Lone Star, Shiner Ruby Red, and Karbach Blood Orange beer (really the trifecta of awesome summer beers), navigated our way to the Texas State Tubes outpost, rented some tubes, and spent 3 hours floating the Guadalupe. For more tips on floating the river in Texas, read our detailed post here. If trekking out to San Marcos isn’t your thing, there’s still plenty of fun water activities to do in Austin! When you book an Explore Like a Local package with Hilton, you can get more than $100 in savings on cool Austin-y things! For instance, Austin has this crazy place called NLand Surf Park, where you can basically surf inside the city! With the Hilton package, you can receive a 90-minute surf lesson including dryland and in-the-water coaching (normally $85) for the price of a 50-minute surf session on the bay waves ($60), plus 50% off a surf session following the lesson. There’s also a bunch of breweries to check out. With your stay at the Hilton you can book an exclusive experience at Live Oak Brewing such as the “Behind-the-Scenes Tour & Tasting” or “Chainrattler Package.” If you’re a beer lover, definitely check out the local brew scene! Read more about our favorite breweries in Austin here. 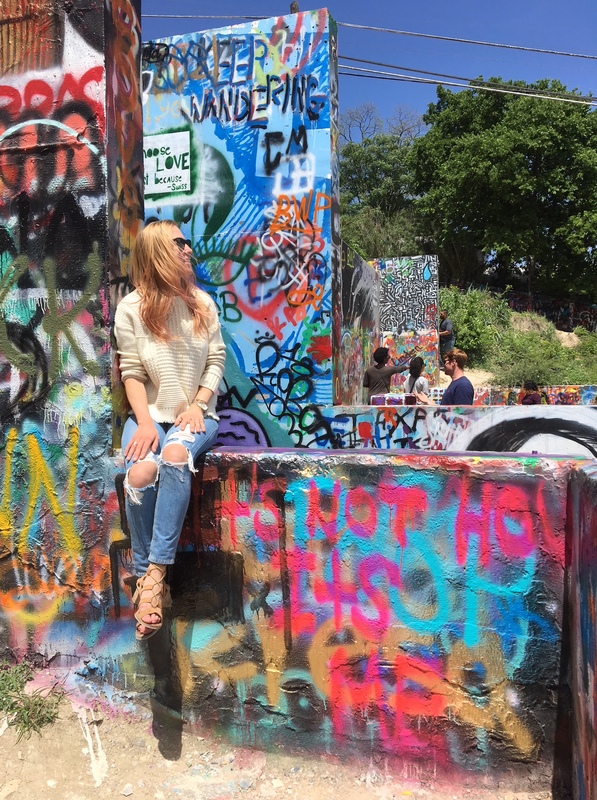 For the grungy art lovers looking for an eccentric Austin adventure, take a stroll on over to Hope Outdoor Gallery aka Graffiti Park. It’s this huge demolished building built into the side of the hill that graffiti artists of all skill levels have taken over. Bring a can of spray paint and leave your mark. There are alleged plans to demolish and reopen the park elsewhere, but for right now it’s still intact and awaiting a a fresh coat of paint. Want more off-the-beaten-track spots in Austin? Check out 10 Photo Ops for a Hipster. For dinner, my recent obsession with Austin has been its Thai food. I rarely rarely go to a restaurant twice (there’s just soooo many good places to choose from!! ), but I legit fell in love with the sticky rice at Thai Kun in the Domain on a work trip and went back immediately the next week. Since my visit to Austin, I’ve also been salivating over Sway. It’s hyped up. There’s a long wait on a Saturday night. BUT IT’S SO WORTH IT. Legit the best pad thai I’ve ever had. And I’ve had A LOT of Pad Thai! It’s a good spot for a date night. It’s a shame for anyone to go to Austin and not take advantage of the glorious amounts of nature at their disposal. Whether it’s brunching outside (that’s a perfectly acceptable amount of nature), skinny dipping at Barton Springs (I think that’s still legal #KeepAustinWeird), or partying out on a lake, there’s something for everyone. Since Clare brunch is my middle name, I highly recommend dining at Josephine House for some tame outdoorsy-ness. Again the wait will likely be long. But the mimosas and decadent platters of food are totally worth it. It’s this adorable little house in the historic Clarskville neighborhood of Austin with a delightful, shaded patio with stripped awnings and wire furniture. Big fan. Also walking distance from the Graffiti Wall if you want to make another pitstop to leave a tag while you wait for a table. If you want to up your ante, book a party bus for you and your closest 40 friends to Lake Travis and then darty on a party barge (ours was Beach Front Boat Rentals). Yes, this is a thing that happens and it’s amazing. I went this past weekend to celebrate the birthday of a friend. The party barge totally crushed it. So decadent. So amazing. I could have sworn I was back at The Yacht Week. Seriously, this thing had a slide. And you get to swim and float around in crystal blue and aquamarine water. Very impressed. Shout out to Life Events for being the HBIC and booking the boat and bus and coordinating the trip! Already counting down the days till my next trip to Austin…what’s your favorite local thing to do in the city? Tags: Austin, Beach Front Boat Rentals, doughnuts, Float, Guadalupe River, Hilton, Hilton Austin, Josephine House, lake travis, Live Oak Brewing, Rainey Street, San Marcos, Sixth Street, Texas State Tubes, Voodo Doughnuts. Bookmark the permalink. Wow, i have a cousin that lives in Austin and definitely want to check it out soon. 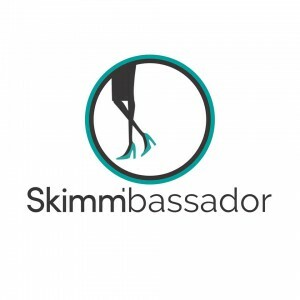 Thanks for the advice and if you get a chance feel free to check our company out!